This week (other than one tapas tour on Tuesday) I am on a “staycation” in Sevilla, and here’s Luna giving me a lesson in lounging. This is her favourite lounging spot in the new Casa Azahar. No doubt I’ll be spending too much time lamp hunting, but I also hope to relax before going off to Málaga next week. It’s been a busy summer and so some “down time” is probably a good idea. I’m not actually very good at relaxing, but it’s nice having a change of routine this week, and also looking forward to seeing the sea again. In 1990 I moved to an apartment in Bristol, England that had what I called my “Spanish kitchen”. It also had a view of a “Spanish roof” from my bedroom window. It was a Spanish kitchen to me because the tiles were terracotta, and the Spanish roof, that looked like this photo, was on a nearby building (not sure why because this isn’t a typical roof style for Bristol). Both those things kept me dreaming about moving to my new home, and then I got a job at a tapas bar there! I was convinced I was on the right path, so even when I was asked to stay in Bristol and manage the bar… I just had to go. I was reminded of my Bristol “Spanish roof” during my Staycation at the Doña María Hotel. This was one of the views from their rooftop. Introducing Sevilla Staycations! 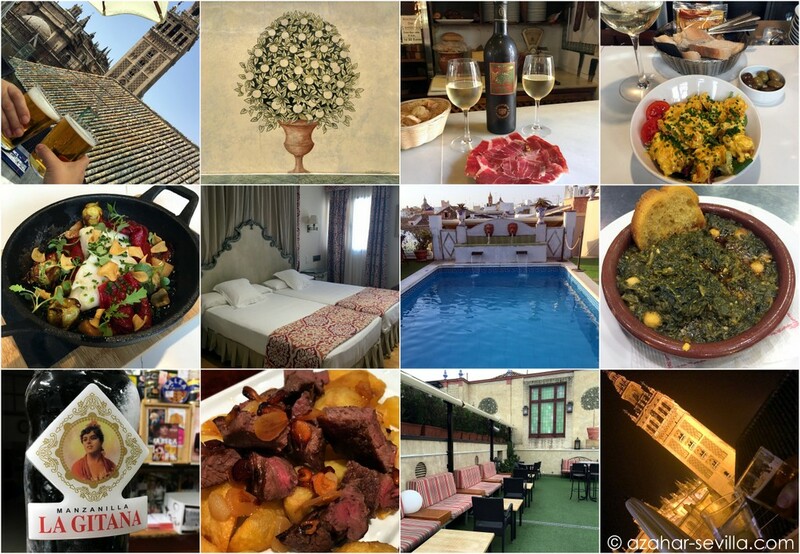 Along with my usual hotel reviews and recommendations on Azahar Sevilla and Azahar Spain, I rather like this idea of taking brief staycation getaways in my home town and finding fun things to do outside my typical day-to-day, as well as focusing on what the hotel has to offer. Well, as you can see, this particular staycation tended to be tapas oriented (surprise!) but it’s also not usual for me to be sitting by a cool pool in the middle of a sunny afternoon, or be up on a fabulous rooftop bar at 1 am. This time I was invited by the Doña María Hotel, a renovated palace that has long had one of my favourite rooftop terraces with killer views. On each staycation I will have a guest with me, and this time it was good ol’ Peter @SVQconcierge. Also, not all staycations will be “invited”. I want to mix it up a bit and, of course, the free stays do not guarantee top ratings. All opinions will be my own based on my experiences. 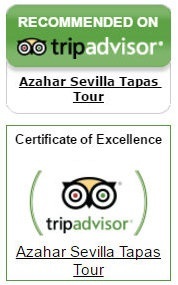 Hotel reviews and Sevilla Staycation experiences will be published separately on Azahar Spain and Azahar Sevilla. Olé!